Living in the Galapagos, we’ve been conscious to avoid single-use plastics, and plastics in general, whenever feasible! We’ve been members of TAP – Travelers Against Plastic, for years and they always have some great tips as well. 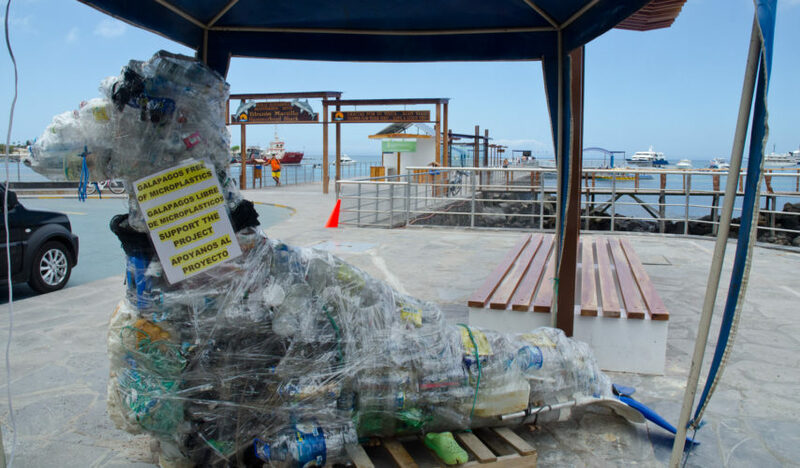 So, from our experiences, and those of our friends and travelers, here are 8 great anti-plastic tips you can put to use when you visit the Galapagos Islands, or travel anywhere else in the world. 8 – Avoid plastic straws! Refuse straws when given the option, instead drink straight from your drink container, or even better travel around with your own reusable or biodegradable straw. There are cool options available now for metal straws or biodegradable straws. 7 – Avoid plastic bags. Bring your own daypack or stuff bag when shopping. Whether it is at a fruit market, grocery store or mall, many stores still automatically put your purchases in plastic bags. You probably already do this at home, so why not do it when you travel too? 6 – Don’t buy plastic water bottles. Perhaps one of the most obvious ones on the list, but sometimes hard to stick to when you are sweating and thirsty in the middle of nowhere. Plan ahead! Bring refillable water bottles with you, and a portable filter/purifier if you are traveling for lengths of time. It will really make a difference. 5 – Check ahead before you “take away”. If you are taking food to go, check and see what packaging the restaurant uses. There are better options than plastic (or even styrofoam!) so avoid grabbing an easy meal that is hard on the environment. Some places allow you to ring your own reusable containers for take away foods too! 4 – bring your own cutlery. Camping utensils are so versatile. A metal spork or travel cutlery set will save you from being stuck using plastic utensils when that is all a restaurant has to offer. Like straws, there are biodegradable options for cutlery now too. Even edible utensils! 3 – Share your knowledge. When you see someone doing things right, spread the word! Write reviews, tell other travelers. Maybe a hotel uses natural materials they’ve scavenged from their surroundings for their furniture, instead of ubiquitous plastic chairs. Maybe a town has some really cool looking recycling bins on their streets. Promote reuse and recycling wherever you go. 2 – Microbeads are bad. They’ve been ingredients in everyday things such as toothpaste, cosmetics and soap. Do a bit of research and avoid products with microbeads that leach into the environment, including drinking water supplies and our oceans. Many countries have already started to ban the use of these tiny plastic particles, but there are a lot of products still using them. 1 – Check your clothing. Did you know nylon, spandex, lycra, polyester, fleece and acrylic are made of types of plastics? These synthetic materials are great in some ways, but cost the environment. We’ll admit being guilty of using these materials ourselves in our clothing, so we need to change too. But when we learned 60% of the microplastics in the marine environment come from clothing, we were surprised! It is the biggest contributor to plastic pollution in the ocean. Each time you wash these clothes, they shed a tiny bit of particles – plastics – that end up in our water. Think about that next time you do your laundry. This article has additional information about plastics in clothing. This article has more information, and this one even more. It really is a big issue. Total elimination of plastics from our lives seems nearly impossible nowadays, but with these tips you’ll surely be a green traveler helping to heal the planet by avoiding as much plastic use as possible! Valeree D. Marek. Since learning of the problem of plastic straws, I have completely stopped using them.